Yu-Mei's previous post about our appearance in the Straits Times prompts me to write a further clarification, largely because my 'mystical Chinatown walkabout' was anything but (which in itself is quite revealing). However, before anyone leaps in to slam the ST for yet another feeble attempt at 'responsible' journalism, let's be fair. Yu-Mei and I had arranged to meet the paper's very nice journalist at a cafe off Club Street, where the music was a bit loud and the ambiance not exactly conducive to conversation. Both of us were probably also a bit psyched, as we were about to give our first ever book reading. And so as the interview got underway and we started to talk over each other a bit (and at speed), I sensed our friendly reporter was struggling to take it all in, and that what she was getting might not be enough for her story. Given this, I was grateful we got any coverage at all, even if some of what we were quoted as saying bore only a tangential relationship to what we had actually said or had written. Which brings me to that 'Chinatown walkabout', during which I mysteriously morphed into Yu-Mei and began to feel the district's 'ancient history' bursting into life around me. Well, not exactly. As I recall, what I actually tried to get across in our interview was how hard it is to get any sense of Singapore's physical past today. I'd set off on a solo heritage walk to try and recreate the route of the 'Kreta Ayer martyrs' (see Chapter 18 of Singapore: A Biography) who in 1927 had marched angrily from the Happy Valley amusement park on Anson Road and then attacked the Kreta Ayer police station, where policemen shot them dead in the street. Thanks to road diversions, the destruction of the old Kreta Ayer police station and the lack of accessible period maps, my attempt was a total failure. Yet luckily, I met a friendly old Chinese man selling prints and his own heritage booklets outside the Chinatown Heritage Centre. As he explained to me how the streets had once been laid out and where the old police station had once stood, he seemed pretty gobsmacked that anyone should care about the 'Kreta Ayer martyrs' or want to retrace their route. The confusion in the ST piece originated with my effort to describe the one time during the writing of Singapore: A Biography when I did feel a very strong sense of the island's past returning to life. This happened, completely to my surprise, when I joined my two year-old daughter's playschool excursion to a fish farm in Chua Chu Kong (in the island's north). I'd tagged along to help out, but on the way over I noticed a sign pointing to the site of the Japanese landings on Singapore during the night of the 9 February 1942. Leaving the little ones to harass the koi, I slipped away for a closer look. Wandering through the mangroves, I had my first, so far only, and at the time extremely visceral, sense of walking with historical ghosts: the soldiers who had fought on both sides as the whole area went up in flames during the Mandai inferno. I'm not saying I saw actual ghosts, nor heard phantom explosions, shouts of anguish or the like; what I felt, instead, was a powerful inkling that the area still retained a memory of the events that had once defined it. It also stuck me just how close Johor is to Singapore, how little distance the Japanese had to come, and how badly Percival (the British Commander in charge of the defence of Singapore) had got things wrong. One has to be careful not to become too nostalgic for bygone streets and pathways that one has never walked down, smelled or got mugged in, places that in most cases now exist only in the historical imagination. And, of course, the rational explanation of my experience that morning was that my historical imagination had got the better of me. Nonetheless, when people complain about the lack of rootedness they feel in Singapore today, not to say the lack of a collective Singaporean identity, I often think that what they are expressing is their deep lack of a sense of place. Obviously, economic development involves urban transformation - in Singapore's case, ceaseless urban transformation. But at the same time, historical buildings and landscapes remain the very essence of what makes a place distinctive and of what, over time, generates a sense of civic pride. Modern spaces can do this as well, provided they are interesting (or even unintentionally humorous): a big tick for the Esplanade in this respect, a big cross next to the derivative 'woo, please look at us, we're a global metropolis' Singapore Flyer. In a weird way, the sheer 'in your face-ness' of ION Orchard currently does it for me too. For me, physical heritage is to a city what the face is to an individual's personality. Wrinkles will appear, the face will inevitably change, and on occasion a facelift and even reconstructive surgery might be deemed necessary to keep things in place or return them to their rightful place. But to destroy this face in an effort to reinvent it, as Singapore's Urban Renewal Authority explicitly set out to do from the mid-1960s (see page 430 of our book), seems to me the civic equivalent of doing a late Michael Jackson. It is quite something to write a book about the history of Singapore. It is quite something else to be in a room full of white-haired men and women who were there for some of that history. Two Saturdays ago, I was at the book launch of The Fajar Generation. Fajar (which means 'dawn' in Malay) was the title of a publication by the University of Malaya Socialist Club in the 1950s. The British charged some Club members (that is, university students) with sedition because of the anti-colonial sentiments they expressed in the publication. While they were acquitted, the incident was arguably a seminal moment in the nascent development of political consciousness and direction in post-war Singapore. The two decades from 1945 to 1965 was an extraordinary era of political turmoil in the modern histories of Malaya/Malaysia and Singapore. The end of the war unleashed concerted demands for greater political representation, self-rule and eventual independence in the face of British attempts to manage the decolonisation process. The character and direction of this struggle were deeply contested. Different strands of nationalist thinking and competing political formations battled to define and shape the character of the future nation states. 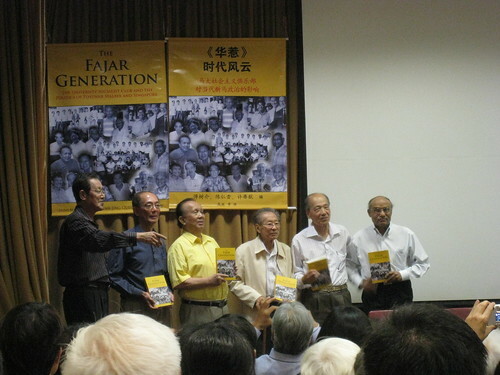 The Fajar Generation tells the hitherto neglected story of a remarkable group of men and women who advanced a radical agenda of anti-colonialism, democracy, multiculturalism and social justice through the agency of the University of Malaya Socialist Club. Through personal memoirs and analytical essays the contributors to this collection illuminate their own roles in that struggle – the hopes and despairs, the triumphs and defeats. At the same time they remind us of just how much of that progressive political agenda is still to be won in contemporary Malaysia and Singapore. The book comprises 13 essays by members of the University of Malaya Socialist Club, as well as Edwin Thumboo's poem 'May 1954', which was written in response to the Fajar trial. The volume was edited by Poh Soo Kai, Tan Jing Quee and Koh Kay Yew, who were all formerly in leading positions in the Club; Poh and Tan were later detained under the Internal Security Act in Operation Coldstore in 1963. The Temasek Review has a more thorough account of the book launch and on YouTube there's a video of Dr Lim Hock Siew's speech at the event (he too was detained under Operation Coldstore --- for 19 years). Suffice to say that it's quite moving to hear the Fajar generation speak in person, yet it's difficult to imagine that these first-person accounts of 1950s and 1960s could have been published and/or distributed in Singapore 20 years ago (that would've been just after another Internal Security Department action, Operation Spectrum). Looking around the room at the book launch, it's clear that there's no shortage of eyewitnesses and voices to add to the multiplicity of how we view Singapore's recent history. It's just whether the conditions are right for them to speak (and for what it's worth, The Fajar Generation is published by the Strategic Information and Research Development Centre, an independent publishing house in Malaysia). The Fajar Generation is available in English or Chinese. Pick it up at Select Books in Singapore, or contact the publisher: sird [at] streamyx.com. Christmas is only about a month away, so if you need to get gifts that say "Singapore!" with zest – why not pick up Singapore: A Biography? It looks pretty, has plenty of pictures so as not to scare off those who might be put off by walls of text, and has everything from swashbuckling adventure to war stories to scandal to political intrigue. If you really really love our book and are thinking of buying 10 copies or more at a go (it makes a great corporate gift if you're from a Singapore organisation! ), you can get a 25% discount from our publisher. Email me (tym [at] post [dot] com) for more details. Trust the timing of these things to happen when neither Mark nor I was in Singapore. The day after I took off to Vietnam on a short work-and-play trip, the Straits Times ran its coverage of our book, side by side with another new release Chronicles of Singapore. We'd been interviewed by the journalist Akshita Nanda a couple of weeks earlier, over coffee just before the reading at Books Actually. I think the report neatly highlights some of the stories that got us excited about writing the book (as you've no doubt heard us mention on this blog). Mark also got to use his soundbite about Singapore being a 'testosterone-laden system' before the 20th century and about the intensity of war accounts meaning that the war section 'practically wrote itself'. The audio recordings and written texts were so powerful that Balasingamchow found herself recreating ancient history while walking the modern streets of Chinatown. I did find the various historical sources powerful and compelling, but the mystical Chinatown walkabout moment was Mark's and Mark's alone. (Ask him about it some time.) On his part, he doesn't quite recall the line about Mrs Siraj – it might've been me waxing lyrical about her. But that's the thing about a joint interview, perhaps: that two excited co-authors might start talking over each other's lines, and it gets a little hard to separate who said what. Just this past weekend, Singapore: A Biography got mentioned in Lianhe Zaobao (Singapore's main Chinese broadsheet), in an article about the recent surge in books about Singapore history and interest in the subject. The journalist Cindy Chia had contacted us when we were both not in Singapore, so I wound up writing her a quote while I was sipping Vietnamese coffee in Hoi An. Q: Can you tell me what sort of approach did you adopt while writing the book? What went thru your thoughts in trying to make history digestible and approachable to the public? Who are your targeted readers? A: The book is targeted at the general reader – not a specialist but someone who's simply curious to find out more about the stories and personalities in Singapore's history. At the same time, academics or specialists will find the book is substantive and rigorous. We generally tried to let the voices of the different historical personalities speak for themselves, whether it's a quote from Raffles's personal letters, or an oral history interview or radio broadcast by David Marshall. We tried to let readers step into the shoes of the various people throughout history and see events through their eyes. It made it, more or less, into the last paragraph of the story. We'll still waiting on a couple other media that have expressed interest in our book, so we'll keep you posted as other articles and reviews appear. One of the benefits of working with the Singapore-based publisher Editions Didier Millet (EDM) is that they really care about the way a book looks. Another enjoyable aspect of working with them was that they were keen to consult with us (yes, the authors!) 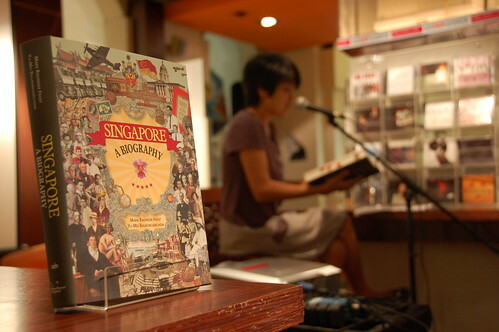 on the layout of Singapore: A Biography and especially on its cover. For this, we especially have to thank our editor at EDM, Ibrahim Tahir, whose overall contribution to the book made him effectively its 'third author'. So how did the cover come about? A while ago, Intuitive Studios (the exhibition design company I am closely involved with – see earlier post) was approached to design a historically-themed mural for a local museum. It seemed like this was the perfect opportunity to unleash an homage to Sir Peter Blake, the famous pop artist and one of my personal favourites, on the Singapore heritage scene. Intuitive's historically-themed pop art mural never eventuated. But the idea of a Peter Blake pastiche was thrown into the hat once more when Yu-Mei and I started to discuss the book cover with EDM, partly because it reflected our philosophy when writing our history of Singapore: that it's all about a multitude of colourful personalities. I didn't like Version A much (and not just because our names were so small). I found it a bit dull, especially the colours. Yu-Mei had a more extreme reaction to Version B, since it seemed to her like the very worst kind of school textbook cover that we were trying to avoid. I could see her point, but I also hoped EDM would keep trying with the Peter Blake-inspired approach. So I asked my designer friend Claire Fleetwood (who runs Intuitive Studios) to chime in with some further suggestions, while I sent Ibrahim and Annie what were probably rather annoying emails where I attempted to deconstruct why Blake's Sergeant Pepper's cover worked and why our Version B did not. Yu-Mei, meanwhile, seemed to have resigned herself to her worst fear: a textbook cover! Arghhhh! OMG! (I think she really has spent too long in schools, you know). Yet that wasn't the end of it. When it was time to launch our online marketing campaign, Yu-Mei asked her friends at ampulets to tweak the cover one last time for our flyer. And the final outcome ... a radiant, celestial Singapore: A Biography! Let those cosmic rays bathe you in historical wisdom, people of the little red dot. Yu-Mei and I have been away. (She went to Vietnam to eat, I had to go back to work). But now we are back - post-book launch - and ready to blog once more with a vengeance. From now on we'll be using this site to publicise news, views, events and reviews related to Singapore: A Biography and as an occasional forum for our thoughts and talks on Singapore history. Your contributions are also very welcome. So if you have some factual errors to report (there are a few we've noticed already), or you'd like to offer your alternative views on Singapore history, or you think there are other individuals who should also take their place in the island's life story, please email us. But first up, coming soon, a post about the cover. Nevertheless, after I made several hopefully not-too-convoluted points about "Finding the Singapore Story", people chimed in with both salient and surprising questions (and sometimes a combination of the two), and we ended up talking about Singapore and identity and citizenship and history. While citizenship is not a topic we really get into in Singapore: A Biography, with a book title like that and the perennial debates about what it means to 'be' Singaporean, it's a natural progression of ideas, perhaps. 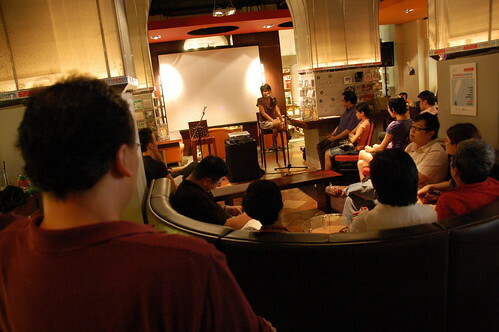 This was the last of our initial wave of book events in Singapore. Thanks to everyone who's come by an event, bought a book, spread the word and/or otherwise helped us out. It was great to see new faces and old.